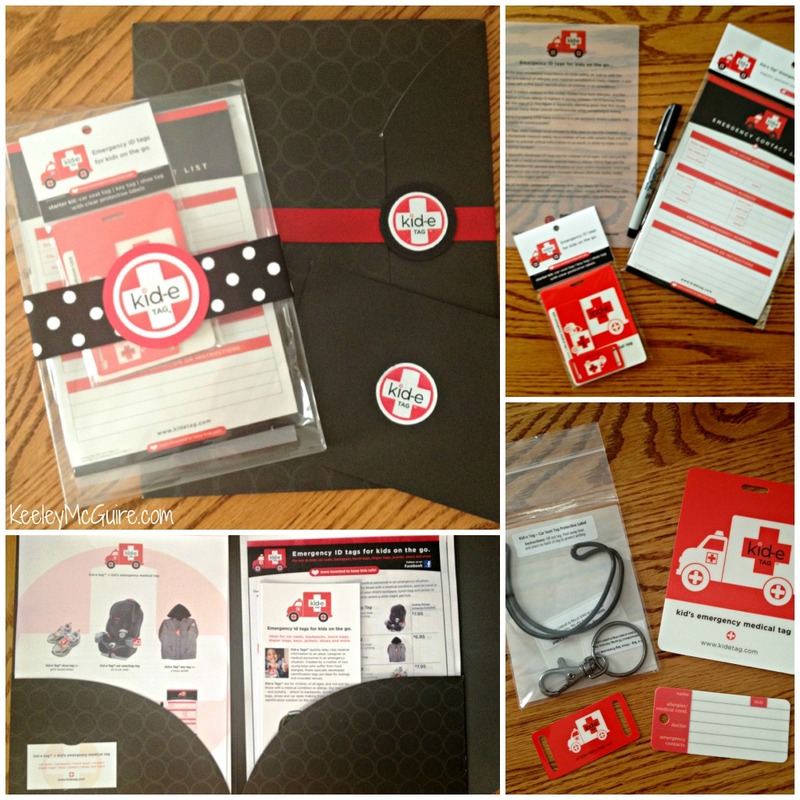 Gluten Free & Allergy Friendly: kid-e Tags™ (Kid's Emergency Medical Tags) Review & Giveaway! kid-e Tags™ (Kid's Emergency Medical Tags) Review & Giveaway! I first met the fabulous Julie of Kid-e Tag™ through their facebook page. I immediately fell in love with their products and mission. Julie is a mom of two boys with food and drug allergies, so she understands the importance of communicating allergies and having that information readily available, should an emergency occur. That's why she created Kid-e Tag™. You can imagine my enthusiam when right before school started, Julie and I decided to team-up, so that not only Little Miss could try and use their fabulous tags, but one of YOU could win some of their products too! Kid-e Tag™ sent us their Starter Kit, which includes a car seat tag/bag tag, key tag, shoe tag, and clear protective labels for back to protect writing. We also received the Emergency Contact List - Refrigerator Magnet to try and use, as well. We used the car seat tag/ bag tag for her backpack. I've always put a tag on her backpack, especially since that's also where she carries her epi-pen. It's so great now to have our new Kid-e Tag™! It's been taking the abuse of my six year old for over three weeks now, and the protective label that's used over the writing is fantastic! It keeps all your personal info safe and intact on the tag. It's big, red and definitely noticeable for someone to see in case of an emergency - whether on the bus or walking through the hallways at school. Anytime her bag is on her back, I know that my info and her allergies are listed close by. I ended up using the key tag for her lunch cooler. I wanted something to be on her lunch bag that is easily identifiable. Even though they eat lunch in their classrooms at her school, it never hurts to have a tag with their name incase they lose it or leave it on the bus. Having her allergens and my contact info listed is comforting incase of a substitute or lunch helper, as an added reminder. I am eager for her next field trip, or even when we travel as a family somewhere, for her to try out the shoe tag, as well. I am always worried when she's on a field trip, playing with friends, or anywhere out of my sight for five minutes ;) the "what if's" -- having a shoe tag is an excellent way to alert people of potential allergens in case of an emergency and who to contact, after dialing 911. If you want to try Kid-e Tag™ products, I highly recommend them! I am in love with our tags and they are a great product for any family with allergies or special needs. Kid-e Tag™ offers FREE SHIPPING from their online store too! Love that. Reasonably priced and made in the USA. Durable, waterproof, and one-of-a-kind! As I mentioned above, Julie has offered one lucky winner here at KeeleyMcGuire.com the chance to WIN a FREE Starter Kit! You'll receive a car seat tag/bag tag, key tag, shoe tag, and clear protective labels for back to protect writing. RIGHT HERE on the Rafflecopter widget. This giveaway will end at 12:01am on 09/23/12. I'd love to win one of these for my son! The key tag looks like it could be worn on a necklace! Love this. Super visible for anyone who might need to see it. Both of my children have numerous food allergies. I love the medical tag! I would love to have the lunch bag tag or the key tag for my son's peanut allergy. I hear a lot of family/friends "Oh...I forgot" and would love the visual in order to jog their memories!! These are GREAT ways to show awareness and safety. Luv it!!! Wow love these! Can't wait to share w/ my friends w/ special needs children. My son was non verbal for several years, and has severe allergies. These would've been amazing to have when he was younger! Still a necessity now, even though he's 12, the key ring and bag tags will be great to tag his backpack and after school activity bags, which carry his inhaler and epi-pen. Love love love these! I love this. It would be so great to have. Would love this for my son in preschool! My fav is the carseat tag, as my guys is still itty bitty. I purchased 2 starter kits for my allergic kiddos, but would LOVE a third to gift to others. I love all the tags in it and have gotten so many positive comments from moms about the importance of identification for ALL children! I would love to have the tag to put on a backpack, it's great that it's so easy to spot! Love the backpack tag! And the key tag! Love the backpack tag. I have a make-shift one, but it looks like this one would be hard to miss! I have been looking for a good car seat ID tag so this would be perfect! Would love to win the bag tag! Love your blog! My son just turned 4 and has a speech disorder called apraxia and multiple food allergies and sensitivities. I actually kept him out of 3 year old preschool this year b/c I was too afraid to send him until I got all of his allergies figured out. This would be a great tool for us. I think the bag tag would be great for school, but the shoe one would be great for field trips or amusement parks.